As a huge Game of Thrones fan, I’m extremely excited to contribute to this “Game of Rows” series. In an effort to bring dragons and magic to our esteemed Millsaps bubble, I will attempt to compare my fraternity, SAE, to one of the houses of Westeros. And the one I have in mind? House Lannister. Words: “Hear me roar”At first glance, the obvious similarity between SAE and the golden-haired powers of Westeros is the animal we both choose as to identify with: a lion. It doesn’t get much more Lannister than having a pair of gold colored statues of the royal beast perched in our front yard. The Lannisters’ simple motto “hear me roar” actually translates well to SAE without any changes. The roar of a lion is notorious and conveys a message of power and pride. Our group is a close-knit one, and we’re really proud to be members. We like to believe that our roar is a loud one. Invariably concerned with their image and presentation, the Lannisters exert great effort into making their image one of composure and power. 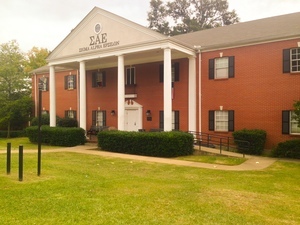 As can many fraternities, we at SAE identify with the desire to appear strong and enviable to the campus. Both proud of who we are and confident in what we can accomplish, we’ll go to great lengths to ensure that our reputation is one of quality. Another primary focus for us has been our legacy, a concept that is paramount to the leader of the Lannister family, Lord Tywin. Tywin always acts with the intention of maintaining his family’s powerful reputation. In a way, a fraternity is comparable to a revolving door of people. A portion of what you accomplish throughout your four years of involvement is done for the future members that will rotate into your chapter; you want to leave your chapter’s legacy in a better place than when you picked up your bid. Being the youngest chapter at Millsaps, it’s been a 25-year process for SAE of working towards having a strong presence on campus, and we want to continue to improve and build on our success up to this point. Constantly focused on maintaining our position in the fraternity scene, we do have a tendency to overestimate how far we can push our limits. Our members have a lot of faith in our fraternity’s overall wit and ability to work around the limitations set for us. This arrogance can often lead to inadvisable decisions and an inclination to underestimate risks, a tendency that is inherently Lannister. Unfortunately, we do not possess the resources and wealth that the Lannisters have at their disposal, leaving us helpless when we venture too far past the rules (currently on probation). It’s also possible that we’re too concerned with our place in the hierarchy of Millsaps fraternities, causing us to lose sight of other areas that could use our attention. Similarly, the Lannisters engross themselves with the battle for Westeros and are ignorant to growing threats outside their kingdom. House Lannister is narrowly focused on the game for the iron throne, and we’re aiming for a game of rows victory. There are times that I wish SAEs were more involved on campus. Millsaps deserves our efforts, and while we are fighting for our place amongst the fraternities, it detracts from our overall campus involvement—an area where we can do arguably more important work for the school. In conclusion, I’d like to issue a message to House SAE, a message that, in a way, is applicable to House Lannister: Show more interest and dedication to issues outside the game of rows, to the areas that could really benefit from our involvement. Hey, there are dragons and white walkers out there, and they don’t really care who sits on the iron throne.